Litter doesn’t stop! So with that in mind Julia Bradbury, Britain’s face of walking and co-founder of The Outdoor Guide have teamed up with Keep Britain Tidy’s Great British Spring Clean campaign to promote litter picking throughout the year! Order your FREE* canvas tote bag to collect litter. The bags will be sent out to all who provide valid email and mailing address by a representative of The Outdoor Guide. The Companies involved are: Julia Bradbury, Trail Magazine, HF Holidays, The Outdoor Guide, Camping and Caravanning Club, Keep Britain Tidy, Premier Paper Group, Outwell, Robens, EasyCamp, Overboard, MarGins, RPSCA, Team Trash Girl and Surfers Against Sewage. The offer opens at 12:01 am GMT on 11/05/18 and closes at 11:59 pm GMT on 01/02/19. Any entries received outside these specified times and dates will not be eligible for a free bag. The offer is open to anyone aged 16 or over in the UK. Only one submission per person allowed. Second or subsequent entries will be disqualified. Entries will not be accepted via agents, third parties or in bulk. The Companies are not responsible for contacting or forwarding a bag to entrants who provide unclear or incomplete information or for entries lost, misdirected, delayed or destroyed. The Companies reserve the right to alter the offer or cancel the offer without notice. No cash alternatives to the bag will be provided. Any photos shared on social media using the hashtag #LitterHeroes will be used on The Companies websites and social media. The email addresses of entrants will only be used by The Companies and not sold to any third party. You will be given the option of opting out in those emails if you don’t want to receive any further news. By signing up and ordering the bag you agree to be bound by these terms and conditions. This is being organised by The Outdoor Guide. Join our mailing list for FREE newsletters, competitions and updates from the team. 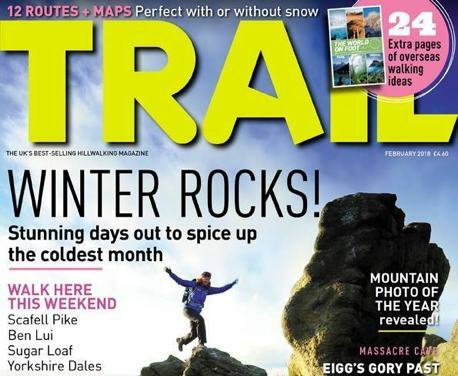 Please keep me up to date with genuinely relevant offers and promotions from our trusted partner, Trail Magazine. You can change your mind at any time by clicking the unsubscribe link in the footer of any email you receive.